Canara Bank PO 2018 notification released: The Canara Bank has released notification regarding recruitment of Probationary Officers (PO). The candidates can check the official website of the Canara Bank to check the recruitment advertisement. The link of the official website of the Canara Bank is - canarabank.com. The selected candidates will be inducted into Post Graduate Diploma in Banking and Finance (PGDBF) programme conducted either by Manipal Global Education Services Pvt Ltd, Bengaluru or NITTE Education International Pvt Ltd., Greater Noida through this current selection exercise for FY 2019-20. The online application process and fee payment will begin from October 23, 2018, and the last day to submit the forms is November 11, 2018. The call letter download link will be made available after December 5, 2018. The tentative date of online test is December 23, 2018. A total of 800 candidates will be selected including 404 general, 216 OBC, 60 ST and 120 SC candidates. Indian nationals with a graduation degree in any discipline from a recognized university or board with minimum 60% can apply. The marks requirement for SC/ST/PwD is 55%. Age limit for the vacancy is 20 to 30 years as on January 1, 2018. The relaxation of age for reserved categories as per the government norms is applicable. Degree with a minimum of 60% marks in any discipline. Based on Online Objective Test, Group Discussion, Interview. Canara Bank will recruit the candidates based on a written examination to be followed by a group discussion and personal interview. The written examination will be conducted across the country in 189 centres. Eligible candidates are required to refer to the official website to know the details of examination centres. Interested candidates are requested to go through the detailed advertisement on the official website of the bank. Also, please note that only online applications would be accepted. Interested candidates can apply for this recruitment. Online test, for selecting candidates, will be held as per the date for the PGDBF course Canara Bank will take 800 candidates. Candidates in the age group of 20-30 years having 'A Degree (Graduation) with a minimum of 60% marks (55% for SC/ST/PWBD) or equivalent grade, in any discipline from a University recognised by the Government of India or any equivalent qualification recognized as such by the Central Government,' are eligible to apply. 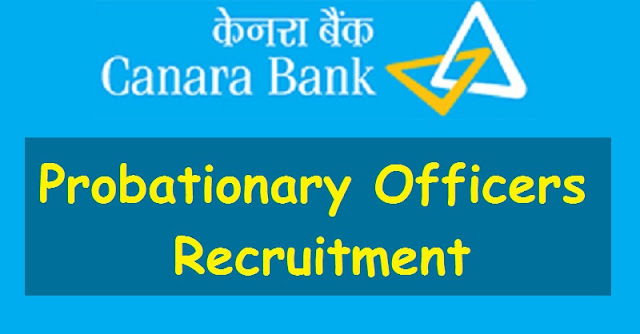 Canara Bank Probationary Officers Recruitment 2018, Canara Bank POs admit cards, Canara Bank POs Results, Canara Bank POs application form, Canara Bank POs Recruitment exam date.